No I haven’t gone mad, but I do need a bigger camera – sometimes! Some of you reading this will recall my decision a few months back to sell my Canon 5D MKII and switch to an Olympus OMD EM5. At the time I felt the EM5 would give me the quality I needed but provide me with a much lighter kit and greater shooting flexibility. The hand grip isn’t large enough so after a while I find my right hand becoming tired because I need to grip the camera just a little too firmly. I suspect Olympus are also aware of this as they have addressed it in the new EM1. I find myself shooting a little too much material because the EM5 is so easy to use. Its size and weight make it ideal for hand-held work but that means I am not slowing down sufficiently. If I were shooting on on a tripod I would be slower and I suspect my work would appear more considered. As it is, I think I am producing more but lower quality work. You may be thinking have read point 2 above “why doesn’t he just put the camera on a tripod?” The answer is my third limitation – this isn’t a good tripod camera. It just feels too small when tripod mounted. It may just be psychological but I want my camera to feel natural when shooting both hand held and tripod mounted. The EM5 doesn’t do that for me. My solution to the above points was to buy the two part optional grip for the EM5. This has made a tremendous difference to the feel of the camera. Initially I thought I would just use the first part of the grip which adds another release button and extends the body forwards. Having experimented further, I find that I prefer using both grips (the other part adding a battery pack and extending the camera downwards) when using a tripod. When I shoot handheld I like to remove the battery pack part of the grip. Now, I have also been toying with a separate problem. I like to produce multi shot panoramic images which I later stitch together in software. I don’t however like the extra weight created by my panoramic head; it’s bulky, very heavy and slow to set up. What a panoramic head does is to mount the camera so that it rotates around the nodal point of the lens, making stitching much easier because there is no parallax error. Providing however that you don’t use a very wide angle lens (or include the foreground), you can get away with mounting the lens over the centre of the tripod and dispense with the panoramic head. Unfortunately, the above scenario limits the height and/or quality of the final panoramic as you can only shoot with the camera in a horizontal orientation. Try to flip the camera through 90 degrees using the tripod head and it no-longer rotates around the lens. This proves quite a problem for most stitching software. 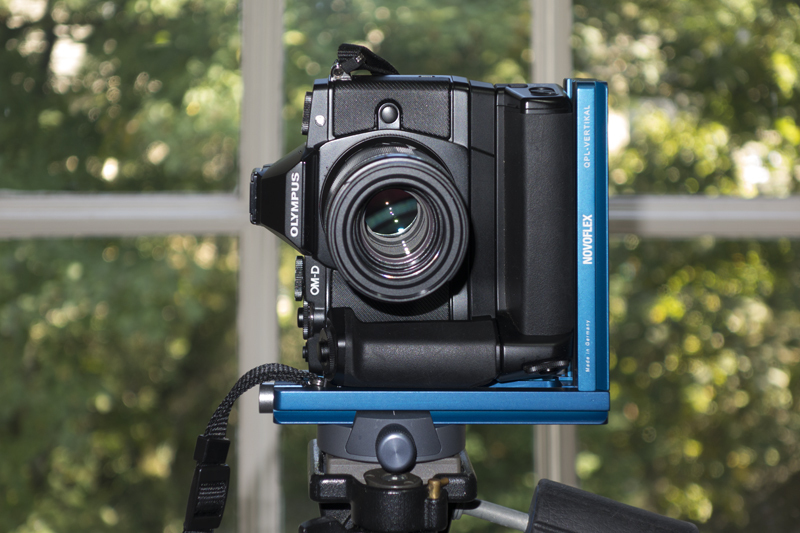 My new solution to this problem is to mount the camera on an L-shaped bracket that allows me to set the camera on the tripod in either a horizontal or vertical orientation. In either configuration the centre of the lens is directly over the tripod and it makes switching between the two a snap. The bracket I have chosen is from Novoflex and is very light. You can see it in the following shot. The nice thing about this set up is that it feels substantial for tripod work yet its very light to carry. Better still, I can easily separate the two grips by using the locking wheel on the back of the camera. 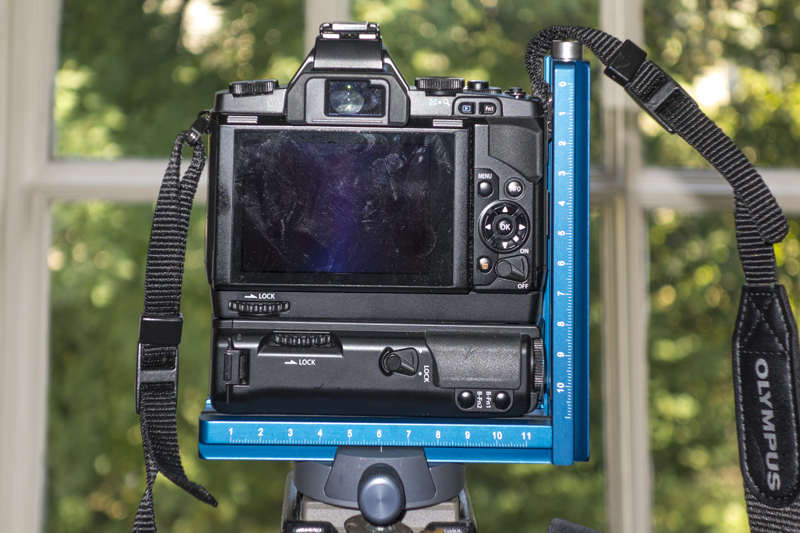 This leaves the hand grip in place on the camera (ideal) and provides an easy way to reattaching the camera to the bracket when I want to work on a tripod. Battery pack and front grip separated. At the moment I love this set up and the flexibility it gives me. I will however report back in the future once I used it for some serious landscape work. Just interested, would you consider trading up to the OMD EM1? Not at present. I got very excited when I heard the new EM1 was launching but the spec is too near to the EM5 in my mind. I think the EM5 is a superb camera and no doubt the EM1 is “better” but I’m not sure by how much. I think it would take something pretty special to change my mind at present. Thanks for sharing Neil.The Really Right Stuff is nice equipment and very sturdy. Unfortunately it’s not always easy to come by in the UK. I also tried to find a similar bracket or one by Kirk before I opted for the Novoflex (which I am very impressed with). I have also ordered a similar bracket from eBay to see how it compares. If it’s good then its a steal at $30 including shipping. More to come on that though. Thanks also for adding in the pics. Hi Pete, I dont remember having a problem with or without the batter grip. I’m struggling a little to understand why the camera doesn’t sit properly. Looking at my bracket, it has a sliding tripod mount screw in it. This allows me to move the position of the camera which might accont for the difference. Are you able to email me an image of something? Hi, thanks for reply. Can’t see how to attach my images – please advise – sorry! Thanks Pete, I can see what you mean. The tripod mount is set much further forward on the MKII than it is on the MKI. That’s why I’m not having an issue. The battery grip would be one way to resolve it but it does seem extreme. Take a look at these. I bought some of these when I had a similar issue with my Sony RX100. They seem a little pricy so probably worth doing a few searches on Amazon. Many thanks. That looks like an interesting option. 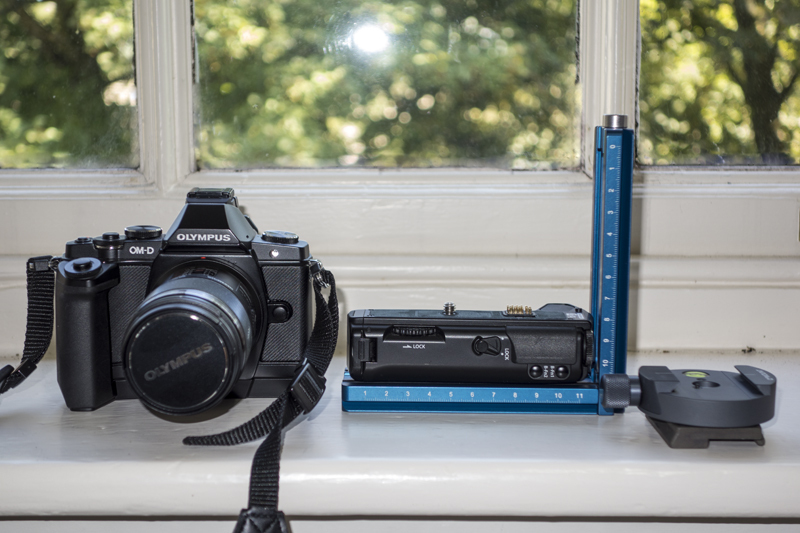 I’ve actually ordered a Chinese grip which is around £15 so a fraction of the Olympus price and, while not quite nice as the Oly version, might work well for a reasonably cost – will let you know.